While I enjoy and partake of the ‘social media’ scene…. nothing can beat a browse through a magazine… the touch and feel, the look, the smell… none of that can be replicated on line! I have to agree with you Margaret. Also I find if I’m reading online I generally skim over news and articles and can get easily distracted clicking on other links, status updates etc. To truly immerse myself in a subject there is nothing quite like print. I’m a huge fan of print magazines and spend an unhealthy amount of time reading them and a worrying amount buying them. The format has many advantages over the web and magazines have stood up much better than newspapers in the face of declining ad revenues and the growth of digital media. But … this video doesn’t sit well with me at all. I wonder what they think they’re fighting back against? I’d wager that almost everyone of the magazines they represent publish online editions and generate advertising revenues through them. Many of them have iPad offerings in the pipeline and most will have bloggers on staff. They’re as much a part of the online ecosystem as any web-native publication. With their considerable clout and resources they should be leading the way, experimenting with new ideas and championing the web and new offerings rather than ‘fighting back’. Yes, anyone who predicts the death of the magazine is probably over egging the pudding but surely these publishers could find a way of promoting their undoubted strengths without trying to create a meaningless ‘them and us’ debate. Hi Mark, Thanks for commenting. My understanding of what they are fighting back against is the movement of advertisers to online marketing. 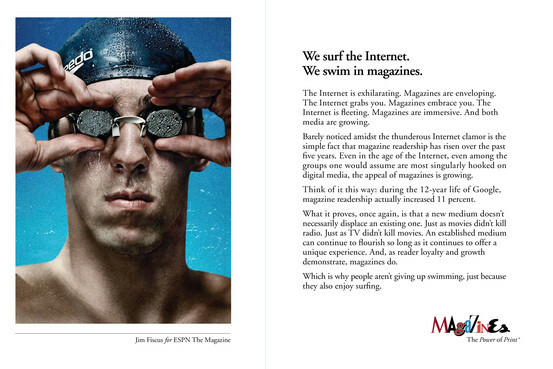 Yes, they all undoubtedly have their own online offerings, but the core of their business activities lies in print. I think it’s reasonable for them to promote the power of print rather than pour all their resources into that which is believed to be killing them. Certainly experiment with new ideas, but not as the main business activity. I think that’s part of the reason for their decline, rushing to have a great online presence but with no idea of how to make money from it. I don’t believe, in fairness, that they are trying to create a ‘them and us’ debate. That debate was started a long time ago, probably when the first banner ad was sold back in the 1980’s.